Bring your besties out and paint yourselves dancing together! 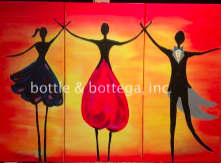 Join Bottle & Bottega at our BYOB studio for a painting party! Ticket price includes paint supplies, instruction, aprons and a take-home canvas!